Amidst a challenging market environment, S-REITs were among the best-performing sectors on SGX in November and December 2018, registering total returns of 2.3% and 0.3% respectively. Most of those gains appear to have been extended in the first two weeks of 2019. Analysts had noted revived investor interest in S-REITs late last year, driven by a flight to safety amidst rising risk-aversion. The trusts’ relatively strong fundamentals – about 80% of them have hedged at least 70% of their debt with fixed rates, while all are required by regulation to have a maximum gearing ratio of 45% – should also help mitigate the impact of a rising interest-rate environment. Manulife US REIT and Keppel-KBS US REIT were also impacted last year by investor concerns over pending changes in US tax regulations. Last month, both US REITs said in separate filings they expect the proposed regulations under Section 267A of the US Internal Revenue Code, as well as upcoming tax changes in Barbados where both trusts have set up holding company structures for intercompany financing, will not have a material impact on their consolidated NTAs or DPUs. There are 34 Real Estate Investment Trusts (REITs), five Stapled Trusts and three property trusts listed on SGX. The sector has a combined market capitalisation of more than S$90 billion, with Retail, Industrial and Office REITs making up the largest segments. Amidst a challenging market environment, Singapore REITs were among the best-performing sectors on SGX in the months of November and December 2018, registering total returns of 2.3% and 0.3% respectively. Most of those gains appear to have been extended in the first two weeks of 2019. Analysts had noted revived investor interest in S-REITs in the final quarter of last year, driven by a flight to safety amidst rising risk-aversion, as US-Sino trade tensions continued to simmer, and global equity markets remained volatile. The relatively strong fundamentals of S-REITs – about 80% of the trusts across various segments have hedged at least 70% of their debt with fixed rates, while all are required by regulation to have a maximum gearing ratio of 45% – should also help mitigate the negative impact of a rising interest-rate environment. For a recently published Market Update on interest rates and S-REITs, click here. For a recently published Market Update on Office REITs, click here. Two S-REITs focused on US office assets – Manulife US REIT and Keppel-KBS US REIT – were also impacted last year by investor concerns over upcoming changes to US tax regulations. Last month, both Manulife and Keppel-KBS said in separate filings that they expect the proposed regulations under Section 267A of the United States Internal Revenue Code, as well as upcoming tax changes in Barbados where both REITs have set up holding company structures for their intercompany financing, will not have a material impact on their consolidated net tangible assets (NTAs) or distributions per unit (DPUs). Click here and here for their full statements. 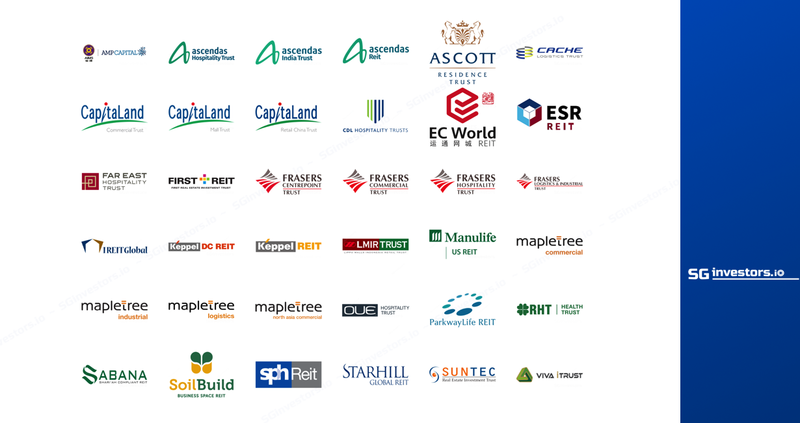 In the 2019 year-to-date, the five best-performing S-REITs were: Lippo Malls Indonesia Retail Trust (+18.1%), Cromwell European REIT (+13.1%), First REIT (+6.6%), ESR-REIT (+5.9%), and CapitaLand Retail China Trust (+5.9%). These five trusts, with a combined market capitalisation of more than S$6 billion, have averaged a total return of +9.9% in the YTD. This brings their one-year and three-year total returns to -15.2% and +11.8% respectively. The table below details the 10 best-performing S-REITs in the 2019 YTD, sorted by total returns. * Note: Cromwell REIT is traded in EUR with SGD equivalents shown in table. Over the first two weeks of 2019, the least-performing S-REITs were: Frasers Logistics & Industrial Trust (+1.6%), Frasers Hospitality Trust (+1.4%), IREIT Global (+1.4%), Dasin Retail Trust +(0.6%) and BHG Retail REIT (-3.5%). They have averaged a total return of +0.3% over the period.